Man's spiderweb turquoise wedding ring accented by 3 white sapphires set in sterling silver by Hileman Silver Jewelry. 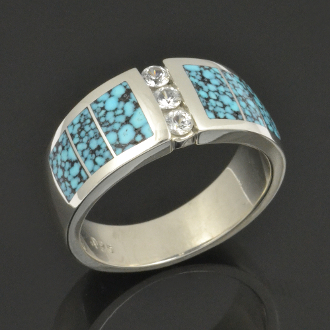 This wedding band is inlaid with 3 pieces of spiderweb turquoise from Kingman Arizona on each side of the ring. The turquoise is a nice blue with black matrix that really makes the blue stand out. The band has 3 channel set round brilliant cut white sapphires totaling .24 carats set in the center. This handsome wedding ring measures 9.5mm wide or 3/8 of an inch at the top of the ring with a slight taper toward the bottom. The ring is stamped .925 silver and hand-signed "MMH" by Mark McBride Hileman. The ring is available in ring sizes 8 to 11 by special order so please allow us 4 to 6 weeks to make your ring for you. Sizes larger than 11 will be an additional charge to cover additional metal and labor costs. Optional metal choices include tarnish resistant Continuum silver, stainless less, and 14 karat gold (white or yellow) for an additional charge. We will need to know your ring size to give you an accurate cost for the gold upgrade. We highly recommend upgrading to Continuum silver for additional strength and durablitly on all our daily wear jewelry or wedding rings.